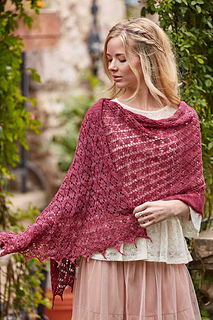 Europeans loved the beautiful shawls imported from Kashmir, but few people could afford them. This demand helped advance the Industrial Revolution: Scottish manufacturers in Paisley created cheaper alternatives on looms with Jacquard attachments. 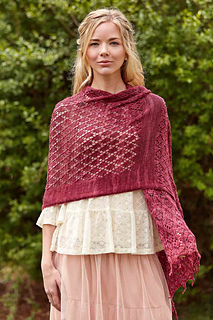 Our Kashmiri Shawl re-creates traditional Kashmiri designs with lace patterning. Finished Size 59 (73.75)“ wide and 15.75 (24.25)” tall. 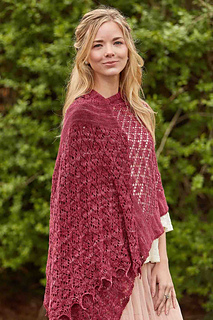 Shawl shown measures 73.75”. Yarn Anzula Cloud (80% merino, 10% cashmere, 10% nylon): madam, 2 skeins. Needles Size 5 (3.75 mm): 24” circular. Adjust needle size if necessary to obtain the correct gauge. Notions Markers; waste yarn for provisional CO; tapestry needle. 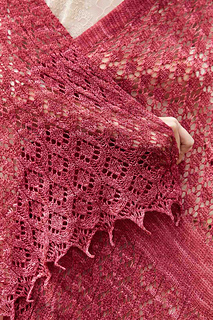 Gauge 19 sts and 24 rows = 4” in lace patt. 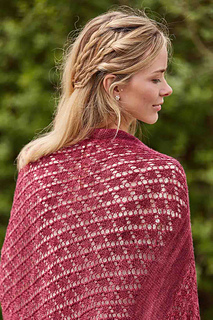 Note This shawl is worked back and forth in rows, starting with a provisional cast-on. 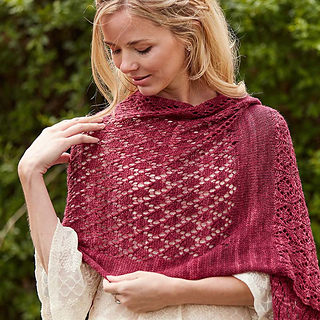 When the shawl is complete, a lace border is worked at each end.